As a waterfall cascades over the flattened rocks in the wilderness atop the Mealy Mountains in Southern Labrador, people have flown in by helicopter to enjoy a picnic lunch. The only noises heard while enjoying lunch atop the mountains is the sound of the waterfall rushing by and animal calls coming from the depths of the wilderness. A nice bottle of wine served with a variety of crackers, cheese, meats and veggies makes the ideal picnic lunch. A romantic spot, not easy to reach, to spend the afternoon while traveling through Southern Labrador. 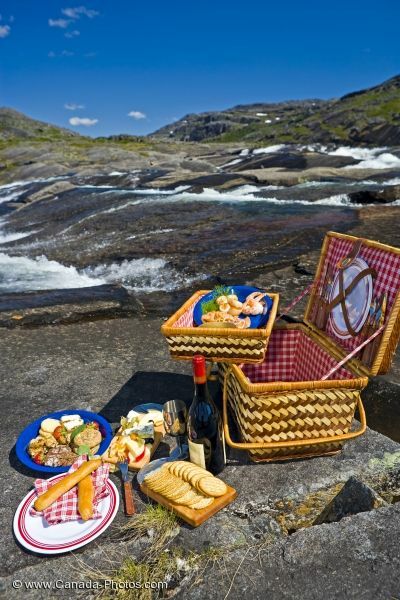 Picture of a picnic lunch in the wilderness of the Mealy Mountains in Southern Labrador.